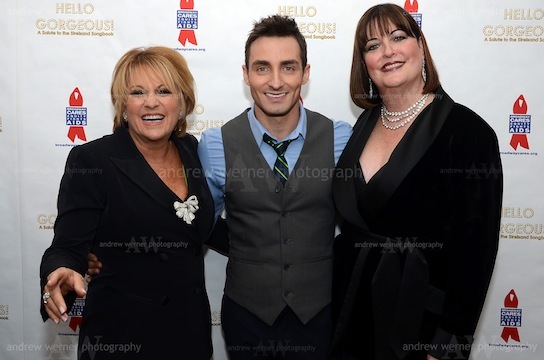 (L-R) Lorna Luft, Scott Nevins, Ann Hampton Callaway. Image by Andrew Werner. A wide range of performers convened on October 12, 2012 Caruso Cast Party style (in fact many regulars including Cast Party host Jim Caruso entertained us as the evening unfolded) to herald the legacy, the humor, the charm, the Barbra-ness. The binding concept of this fund-raising evening was to have multiple performers do their versions of tunes from many eras of Streisand’s career. Not *being* Barbra, host Scott Nevins informed us, but doing a version of Barbra’s tunes. The one exception to this rule was a Barbra impersonator Ms. Streisand appreciates so much she hired him in the past for a party for her pal Donna Karan — the magic of this performance was that he wore no makeup but stood in jeans and jacket and wowed us all. Advance publicity provided a rough rundown of participants. I enjoyed every respectful, often roof-raising performance. A few early evening highlights included Jim Caruso’s endearing medley of “Sweet Zoo” (“I dreamed last night that I was a tiger”) and “A Kid Again / I’m Five” and Natalie Johnson‘s “He Touched Me” in a big goofy style. And then — the performances of Ann Hampton Callaway and Lorna Luft, alone and together, took the evening to an entirely different dimension. These performers were the crowd highlights judging from our rousing, often standing, occasionally quite prolonged ovations. Ann solo performed “Cry Me A River” in a quietly swinging style that erupted into a cry of the heart. She finished her single set with “I’ve Dreamed of You,” the tune for which Callaway wrote the lyrics to an existing Irish melody for the Streisand-Brolin wedding accompanying herself at the piano. Her introduction addressing her own partner and the performance of this smashing quietly powerful adult love song just broke my heart in that lovely cabaret way. Lorna solo performed “The Music That Makes Me Dance” complete with verse in a BOFFO version that honored both Streisand and her mother’s concert treatments of this tune. Ann and Lorna together performed the Streisand-Garland duet “Happy Days Are Here Again” / “Get Happy” with a marvelous twist that Ann reported afterwards was Lorna’s own idea. Dressed in nicely paired black tuxedo-y outfits (Lorna in jacket and slacks and Ann in a marvelous long dress — both outfits evoking black tie) Lorna at our LEFT in the Streisand location and Ann at our RIGHT in the Garland location — Lorna took Streisand’s “Happy Days” and Ann took “Get Happy.” As Ann reported later, she felt as if Judy Garland had her arms around them as they performed. The crowd rose to its feet, and the applause was enthusiastic, earned, and prolonged. A lovely evening.